Chris Longenecker, a Certified Veterinary Technician in Reading, PA, contributed to this article. 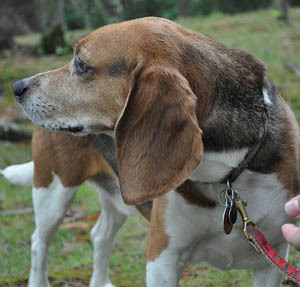 Jonah, a 3-year old Beagle, had been seen by three different vets to find the source of his pain. His owner, Mary, described Jonah as having trouble wagging and lifting his tail. Occasionally, he would have trouble urinating and defecating. His family vet put him on pain medications, but they didn’t help much. Mary also noticed that Jonah would occasionally chew at his back leg. “Because he was painful” she thought. But nobody would take her seriously. That’s when I met Jonah. His physical exam was normal, besides the fact that he did have mild but consistent pain in his lower spine. Stretching his tail over his back would also cause pain. Otherwise, everything else checked out normal. Beagles are prone to slipped discs, but Jonah didn’t show the classic signs. These include back pain and weakness or paralysis in the back legs. I wanted to take Mary’s concern seriously, so we had a heart-to-heart. There was clearly something wrong with Jonah. An MRI was the next logical step… and a big leap of faith. Mary went for it. Imagine our surprise when the MRI revealed a mass in the lower spinal cord, most likely a tumor. We had talked about the diagnosis, surgery, its possible outcome and quality of life. Mary opted for surgery, despite of the risks. She wanted to give Jonah every possible chance. Surgery confirmed the mass exactly where the MRI said it would be. However, it was impossible to remove it entirely. In a case like this, we say that we "debulk"' the mass, i.e. that we remove the bulk of the tumor. Despite the invasive surgery, Jonah was still able to walk soon after waking up. Spinal surgery is very delicate, so we typically expect worsening of the signs initially. A week later, we received the biopsy report, which confirmed a tumor. Unfortunately it was cancerous, an aggressive cancer of the cartilage called chondrosarcoma. Fortunately, it was a slow growing tumor. Two weeks after surgery, at suture removal, Jonah was walking and wagging his tail, with no signs of pain! As our pet’s best advocate, we need to keep pushing until we get the answers we and our pets deserve. If we are not satisfied with the answers we’re getting, we owe it to them to ask more questions, to demand better answers, and, if needed, to be referred to a specialist. Jonah is a perfect example of this philosophy: his owner kept pushing until she found somebody to take her seriously. In the end, Jonah is the clear winner. He lived happily for a long time after surgery, with a dramatically better quality of life.